Truly a global musical event, the Mateel Community Center’s 28th annual Reggae On The River will light up Benbow Lake State Recreation Area in Garberville, CA on the weekend of July 21 and 22 with an exciting blend of reggae and world music talent from the far corners of the earth. Featuring a line-up consisting of more than 30 classic and cutting edge artists on two stages, the festival will celebrate Jamaica’s 50th anniversary of independence from imperial rule and will honor this momentous occasion by presenting some of the island’s best talent. These festivities will include performances by next generation rising stars like Romain Virgo, Duane Stephenson, and Turbulence; a rare U.S. appearance by the triple-platinum recording artist and reigning queen of Jamaican dancehall, Lady Saw; stalwart performers like Fantan Mojah and Yami Bolo; and elder statesmen such as Winston Jarrett and the one and only Toots and The Maytals, the artist credited with coining the term “reggae” with his 1968 hit, Do The Reggay. The festival will also feature a rich selection of artists from the fertile soils of St. Croix, one of strongholds of modern reggae music, with sets by the island’s two premier bands, Midnite and Bambu Station, along with debut ROTR performances by two of the island’s most exciting female vocalists, Reemah and Lady Passion. From the continent of Africa, the festival will showcase one of Zimbabwe’s most prolific artists, Oliver Mtukudzi & Black Spirits, who has released more than 57 albums since his start in 1975 and is also recognized as one of the Africa’s greatest humanitarian artists for his groundbreaking work to combat HIV/ AIDS. Also featured will be the emerging talent of South Africa’s Nkulee Dube. The daughter of reggae legend, Lucky Dube, she fuses ethno-soul, jazz, reggae, and African influences and received a whopping 6 nominations at this year’s 31st annual International World & Reggae Music Awards, where she’ll appear just before coming to ROTR. The event will also feature a rare West Coast appearance by the legendary Calypso Rose who hails from the island of Tobago. With more than 800 songs to her credit, she is the most prolific and accomplished female calypso artist of all time. Tickets are still available at www.reggaeontheriver.com and at outlets throughout Humboldt/ Mendocino Counties and the North Bay Area for a price of $110 for the weekend pass. Please visit the ticket page of the festival website for a list of ticket outlets and note that advance tickets are advised. Single day tickets will be available at the gate only this year and will be priced at $60 per day (even if weekend passes sell out in advance). Campground reservations are currently available at Benbow Lake State Park and Cook’s Valley Campgrounds (along with the campgrounds at Benbow Valley RV Resort and Richardson Grove, both of which are already sold out). All of these campgrounds are either on the shuttle route or walking distance to the concert. Benbow Lake Campground will be operated by the Mateel Community Center and will offer a quieter family camp option, while Cooks Valley Campground will be the place to party late into the night. Both campgrounds are offered exclusively to ROTR attendees for up to a 3-night stay, July 20-22, with individual, group site, and RV camping options available. For more information and sales links, visit the camping page of www.reggaeontheriver.com and it is advised these reservations be made in advance. Please also note that significant improvements have been made to the festival shuttle service and this complimentary and efficient shuttle will offer the best way to get to and from the event, with regular service and direct routes to the main festival campgrounds, plus the towns of Redway and Garberville. There are also limited free and paid parking options in the town of Benbow. For more information call the festival office at (707) 923-3368 or go to www.reggaeontheriver.com, and don’t delay another minute in making your plans for the 28th annual Reggae On The River on the weekend of July 21 & 22 at Benbow Lake State Recreation Area. It’s going to be an incredible experience that, with your support, will send us off from Benbow in true Reggae On The River style and also set the stage for the festival’s long-awaited return home to its original French’s Camp venue in 2013. 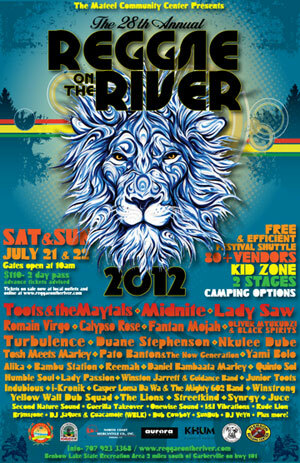 Get your tickets now and don’t miss the 28th annual Reggae On The River!